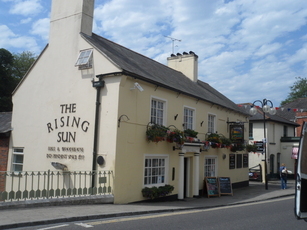 Its changed hands recently, with the landlords from the Albion in Wimborne taking over. They are gamely attempting to improve the place, especially food wise: you know the score, sanries and bar snacks served on artisian wooden handled plates. They do seem to be in constant arguments with various people: an aocoholic local worthy, the folk committee, punters having a go at their hound deficating in the garden. The food I've had has been OK. Beer (Tanglefoot) is excellent. The bar is full of local foul-mouthed cackers, especially on a Saturday afternoon. One charmer plonks his internet Asian bride on a sofa with a drink and an iPad, and slinks off with his gobby mates, making all the thick cacker comments you would expect from Dorset inbreds. But I still go there. Beer is OK and I'm left on my own. Visited (passing through) on a beuatifully sunny Friday evening. Seemed popular with the locals. Food was tasty and generous portions. Sat at the outdoor seating/decking area, by the river, hemmed in by buildings a bit, but there is a fabulous weeping willow just up stream. Shame that gardens have such a high percentage of smokers these days, and being a smallish area you couldn't get away from them. We arrived at 6.56pm and were told food stopped being served at 7, that customers were served in strict order (3 ahead of us in the queue), and that if we didn't get our order in by 7 it would be too late. Fortuntely another staff member wandered up to help serve, and the queue were only ordering a couple of drinks each. I was left wondering what I would have said if we had missed the 7pm deadline. On the plus side, my husband was still parking the car, and I had no money on me, but he still accepted my order. 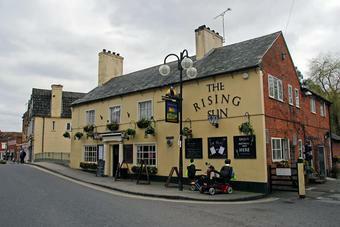 So overall, a likeable pub, and a 7 rating. Pretty good pub. The beer served here is good AND it is always served in the right glass. I.e. Hopping Hare is served in a Hopping Hare glass. One of my favourite beer gardens anywhere. Back in Wimborne from London to see the folks I came here with a few mates - i walked out into the garden for a smoke and realised why I loved it: brook babbling away beside, huge willow tree above, the faint whiff of muck-spreading on the breeze.... ah, I'm home!